Heat oven to 350°F. Line 2 cookie sheets with parchment paper or foil. (If using foil, smooth out all wrinkles.) In large bowl, break up cookie dough. Stir or knead in flour and pumpkin pie spice until well blended. Remove half the dough, and refrigerate remaining dough until needed. Sprinkle 2 tablespoons flour onto work surface. With rolling pin, roll dough 1/8 inch thick. 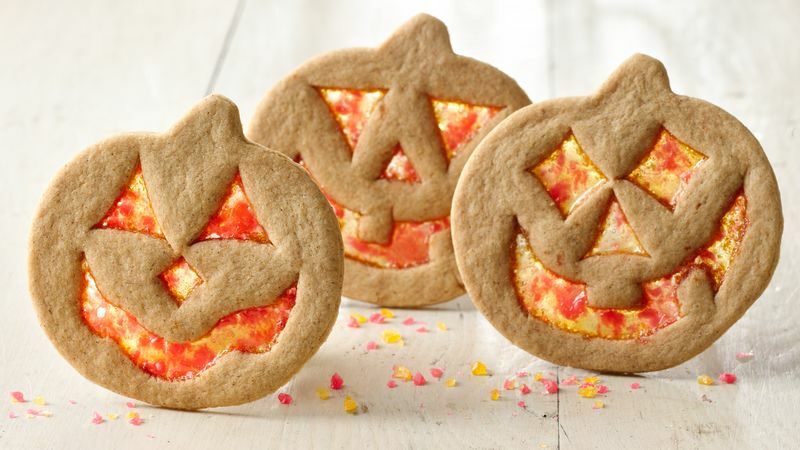 With small sharp knife or cookie cutter, cut out 4-inch pumpkin shapes. On cookie sheets, place shapes 2 inches apart. Cut out facial features from pumpkins. Repeat with remaining dough. Bake 12 to 18 minutes or until edges of cookies are light golden brown, and candy is melted and fills cutout areas of cookies. Cool 2 to 5 minutes on cookie sheets or until candy is hardened. Carefully remove cookies from cookie sheets to cooling racks. Cool completely, about 15 minutes. Get cracking! To crush, place the unwrapped candies in a resealable freezer plastic bag. Set the bag on a towel to protect the work surface underneath. Strike the bag repeatedly with a hammer, rolling pin, meat mallet or heavy can of food until the candy is broken into small pieces.